Historically, the latest innovations in vehicle technology debut on high-end luxury vehicles. Developing new features is an expensive endeavor, and usually only wealthy shoppers are willing to pay for them. Features such as a navigation system, stability control and even traffic-adaptive cruise control were once the domain of high-priced cars, but now they are commonplace on even budget models. That means if you have an appetite for the latest in automotive tech, you probably won’t have to wait long for those features to become available in more affordable vehicles. If you’re an avid early adopter, however, you’ll likely need a bigger budget. Here’s an overview of vehicle technology that’s available now in luxury vehicles and a taste of what you can expect to become more widespread in the future. Automated driving is a hot topic in the car business, with automakers racing to be the first to bring a self-driving vehicle to market. But there’s a long way to go until the concept of a true self-driving car is finally realized. Despite what some Tesla owners seem to think, the carmaker’s Autopilot system is not a substitute for an alert driver. The person at the wheel must remain hands on and eyes up. But it is one of the better-driving automation systems available, and it’s on the Tesla’s lowest-priced vehicle, the Model 3. In a few of its vehicles, such as S-Class models, Mercedes-Benz has a similar “partial driving automation system,” to use the latest definition from the Society of Automotive Engineers. But the Mercedes system isn’t as well-tuned for real-world usability. Its highest level of automation, Active Distance Assist Distronic, slows the car to uncomfortably low speeds when approaching curves or toll booths and also limits the speed to the posted limit. Tesla has its issues, too. In Autopilot mode, it will occasionally stray if the lane markers are faded, and that can be alarming at 65 mph. Both do a better job in dense stop-and-go traffic, where they are able to stay in their lanes and maintain space between themselves and the car they’re following. Cadillac’s Super Cruise system is more advanced and better suited for highway use, using mapping and GPS data to “geofence” its operation. That may sound limiting, but in conjunction with Super Cruise’s myriad sensors and cameras, mapping makes the system more sophisticated and less susceptible to misuse. For Super Cruise to function hands-free, you need to be on one of the 130,000 miles of mapped freeways in the U.S. and keep an eye on the road. And, yes, there are sensors in the cabin to ensure you’re doing that. Now that many cars can automatically slow to match the pace of traffic and stay in their lanes, look for more additional safety features to arrive in some luxury cars. Top-of-the-line Mercedes and Lexus vehicles have automatic steering avoidance, which means they can automatically swerve to avoid objects and pedestrians in their paths. Also available on these vehicles is emergency stop assistance, which senses if the driver has become unresponsive. If that happens, the system can slow the vehicle to a stop within its lane, activate the hazard lights and summon emergency services. Another Mercedes technology, Pre-Safe Sound, emits a specific sound inside the cabin when a collision is imminent. Mercedes says the sound is designed to trigger a natural reflex in your ear canals that helps shut out the loud impact and airbag deployment noises in a crash. Technology advances aren’t limited to driving automation and safety. Many innovations in luxury cars pertain to passenger convenience and pampering. Some current Tesla, BMW and forthcoming Audi models will squeeze themselves into and out of tight parking spaces remotely — you don’t even need to be in the car. Magic Body Control from Mercedes-Benz scans the road ahead in order to react to bumps and ruts. In a fraction of a second, the system executes a specific suspension motion to counteract a road flaw in an effort to ride over it as though it were smooth and flat. Audi says it will have a similar system on the forthcoming 2019 A8 sedan. Nearly all of today’s luxury sedans offer massaging seats to alleviate fatigue, as well as heating and cooling. Mercedes takes this a step further with its Energizing Comfort system, which combines massage with climate control, air fragrancing, lighting and audio. The resulting programs, according to the automaker, can help encourage relaxation or invigoration. Remote control through telematics is also gaining in popularity. For example, if you’re buying bulky items, the seats in the 2018 Land Rover Discovery can be folded remotely to make room while you’re still at the checkout stand. Premium audio options are easy to find, but audiophile-level systems remain exclusive to luxury vehicles. 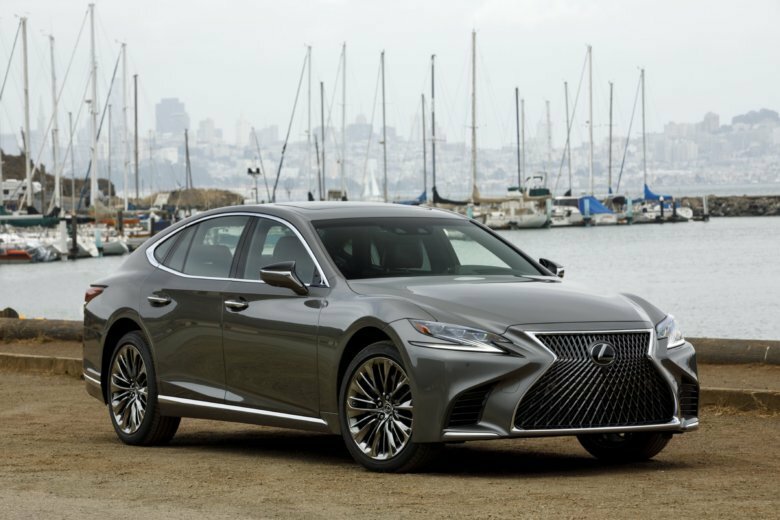 For about $2,000, a powerful 23-speaker Mark Levinson surround-sound system can be added to a Lexus LS sedan. That represents one of the more desirable yet affordable choices. At the upper end of the price spectrum, you can spend upward of $7,500 for a Burmester audio upgrade in a Porsche Panamera and more than $9,000 for the Bespoke audio package in a Rolls-Royce Ghost Series II. EDMUNDS SAYS: There’s a lot of tech in luxury vehicles and more on the way. If you’re an early adopter on a budget, just wait a few years. Most legitimately useful features will eventually be available on more affordable cars.